Good morning, lovelies. I hope you all had a perfectly splendid weekend. I found myself busy, busy, busy what with all the planning that I've been doing for the upcoming shoot I'm styling for Kate Spade. So exciting and fun, but goodness - it sure has been a lot of work. But it's the fun sort of work. The work you want to do. God, I love my job. So anyways, back to this color story of mine. Shades of lavender and mint? What do you think? Are you liking the way these colors go together? 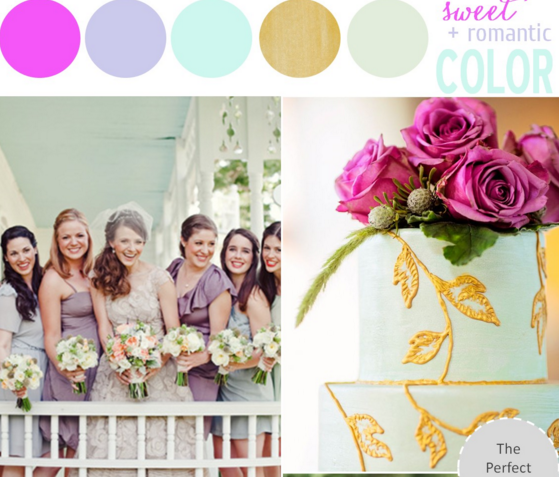 I, for one, think that this blend of cool colors makes for the perfect Spring and Summer wedding palette. It's romantic, it's fresh, and they're just the sort of colors I'd love to see more of this year! Can't wait to see more? Remember when I put together this palette last January? Definitely a fun and unique approach to wedding colors! 7 Comments " Color Story | Sweet & Romantic Color "
Gorgeous detailing on that cake. As always, I just love the different bridesmaids dresses! The gold works so well with the pastels! The lavender & mint is perfect together & I really like how you added a bit of gold -- so great for spring! Pretty colours! Love the eucalyptus in floral arrangement.